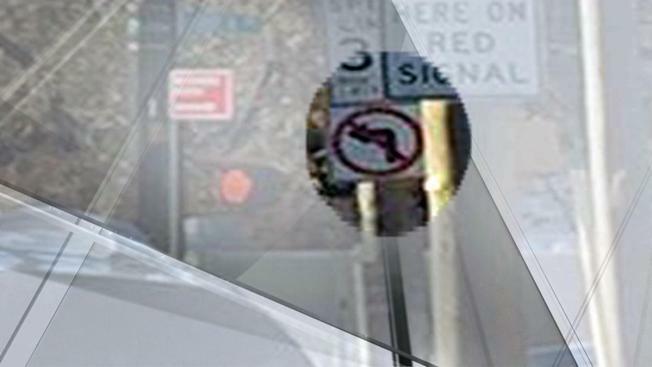 A fake traffic sign that briefly popped up at a Staten Island intersection in November appeared to prohibit drivers from turning left. Many drivers who had lived in the area for years turned left anyway -- but some ended up getting ticketed by police, and despite officials determining the sign was fake, they're still stuck with the tickets. Louis Fricke is among the drivers flagged down by police in mid-November at the intersection of Arden and Woodrow. He hadn't seen the sign, which appeared to prohibit him from turning left onto Arden. Fricke recalled, "I rolled down the window, he says, 'You made an illegal turn.'" "I said, what do you mean?' He said, 'There's a sign, you can't make a left turn,'" said Fricke. "I was like, 'I didn't see it, I've lived here for seven years." Fricke was among several in the neighborhood who got ticketed in mid-November. Councilman Joe Borelli got calls soon afterward about the odd sign. "This was a sign that was put in a very poorly visible location," Borelli told NBC 4 New York. "It appeared smaller than an original DOT no-left turn sign, and it didn't have the official DOT logo." After getting calls from Borelli, the Department of Transportation checked it out. It turned out it was a fake sign, possibly put up by a contractor doing work, Borelli suggests. The sign was taken down by the DOT, and a letter provided to drivers who were cited for making left turns stated, "A review of our records... does not indicate a left-turn restriction at this intersection." Still, some people have been ordered to pay the fine. One driver was told the date of the letter, Dec. 1, didn't line up with his mid-November ticket. "What is incredibly inexplicable is how the judge found them guilty after they had been given a letter by the DOT," said Borelli. Asked about Judge Brian Levin's ruling and the tickets, the Department of Motor Vehicles told NBC 4 in a statement, "Under state law, if a person believes that he or she was improperly convicted, they may appeal within 30 days of the conviction to the DMV Appeals Board." The NYPD would only say that officers enforce all moving violation laws in the city. Fricke plans to take his ticket to court, hoping the same judge will dismiss the violation and clear up the street sign confusion. "Is this how we're living now? I could hang up a sign and a cop can start handing out tickets?" said Fricke.